Yes It's me. I know it’s been over a month since my last post and despite coming back to Melbourne over a week ago, I’ve just been so busy with getting things back on track that I haven’t had the chance to blog (ok I admit, it’s also due to the post-holiday blues that had me unmotivated to update sooner). I assure you that I haven’t abandoned this blog – in fact, I’ve got so many great posts planned, I just need to now find the time to write them all! Whilst travelling, I was makeup-free virtually every day. I did attempt to put on foundation and eye makeup on the first 2 days whilst in Kuala Lumpur but within 30 mins of being out the humid weather, I looked like a grease ball and it was not a pretty sight at all. So other than moisturisers and sunscreens and essential skincare items, I was a total non-beauty addict for a month. Understandably, I was suffering from major beauty withdrawal symptoms and since I've been back, I've been eagerly rediscovering my beauty products and falling in love with them all over again. I also lament that I didn’t have the opportunity to go beauty shopping whilst in Malaysia (other than a quick duck into Watsons to pick up a Majolica Majorca mascara). Travelling with family doesn't result in the most conducive environment to spend an hour looking at makeup and beauty products (not with a whinging 15 year-old and bored uncle and dad in tow). I didn’t bother with trying to find cosmetics in Cambodia or Vietnam as they didn’t really have a developed enough beauty industry (and if they did, I didn’t know where to look for them). Don’t go on your first family trip with 2 sets of families. You will spend more time arguing about where to go and what to do than actually doing it – highly inefficient use of time. Never underestimate the bond of family– despite all the disagreements and fights, we didn't hold a grudge and let bygones be bygones. Otherwise, we would have killed each other or gone insane (which I almost did towards the end). Blackheads have equally strong bonds in humid weather. My nose was constantly plagued by them. Boy did I love my ASAP glycolic scrub for it and sorely missed my clarisonic pro last month. I don’t think I’m ever going to leave that gadget home when I next go on long travels. 80% DEET spray and a personal electronic mosquito repellent will become your best friends when in SE Asia. Sadly I didn't have these items with me and my Aerogard could barely stand up to these pesky blood suckers. Mozzies can definitely ruin your holidays. Fruits in Asia tastes 10 times better than back home because they don’t use pesticides and are allowed to ripen on trees. Jackfruits and sugar cane juice were my daily staples in Vietnam and Cambodia. Staying in third world countries, I appreciated what I have even more and it really puts life into perspective. A very tasty meal in Cambodia is often less than US$2 (which is basically the same as A$2 these days). Most people there get by on less than US$5 a day! With this in mind, it’s going to make it hard for me to splurge on my next beauty buy when I think of how many mouths that money can feed in poorer countries. By the end of the trip, I made a commitment to myself to be show more kindness to those I meet in life. Incredibly every time I’m upset about something/someone, thinking about being kind to them calms me right down. It really must be karma at work already! 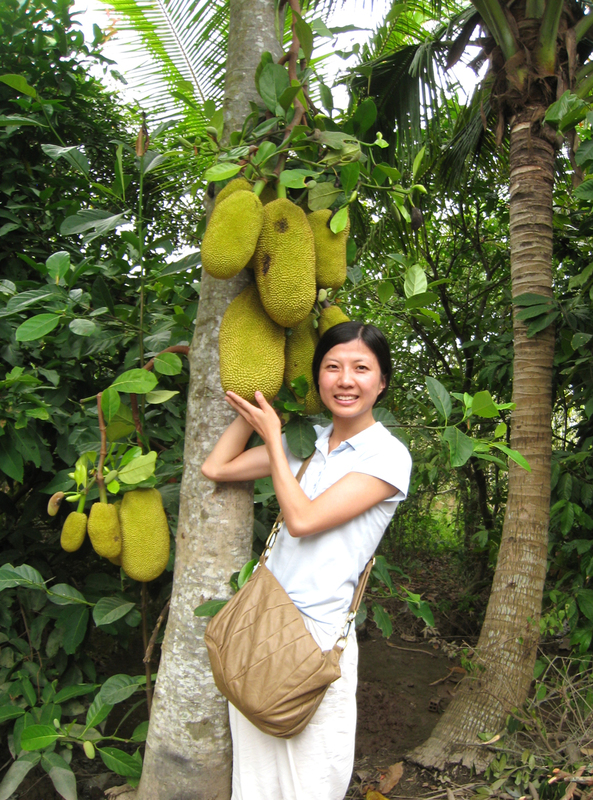 I don't intend to post too many photos from the holiday since they aren't very beauty related (and I haven't yet sorted through them), but here’s one of me and my all time favourite fruit – the jackfruit, taken on a fruit farm along the Mekong Delta. Looking forward to getting back into the groove of blogging again. Glad you survived the family trip unscathed!! Welcome back to blogging. =) And eeks, I detest jackfruit - I was forced to eat it the first time I went to Malaysia and I nearly threw up. The texture is too slimy and weird for my liking. You must have the super ripe ones as they can get slimy but i love their sweetness and smell and there is the crispness when they're just slightly under ripe. I guess it's not for everyone though. Welcome back Amy! That jackfruit sure looks yum!